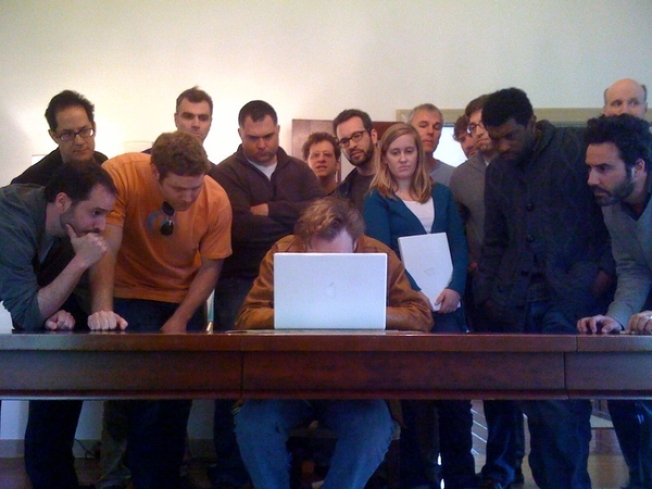 Conan O'Brien and his crack team of writers hard at work crafting the perfect tweet. Conan O'Brien has not lost his sense of humor just because he can't show his face on television for a few more months. And to prove how much funny he still has left in his pasty white noggin, the former late night talk show host will be in the Bay Area for three nights in about a month. O'Brien was forced to cancel an appearance at the SF Sketchfest earlier this year because it was scheduled during his epic battle with the chinned wonder. The funnyman vowed then to make it up to the Bay Area when the late night drama calmed down. The former Tonight Show host has had over a month to lick his wounds (and $32 million) to finally make good on a promise to return to San Francisco. O'Brien will bring his "Legally Prohibited From Being Funny on Television Tour" to the Nob Hill Masonic Center on April 22 and April 23 and he will also perform at the San Jose Event Center on May 5. He will perform at 27 other cities across the country. “It was either a massive 30-city tour or start helping out around the house,” O’Brien said in a statement. He will be joined on stage by fellow unemployed funnyman Andy Richter, his former Tonight Show drummer Max Weinberg and as many as 40 of his former staffers. Reports are O'Brien won't make a dime off the shows either, with all the proceeds going to his former employees. Tickets went on sale Thursday and on last check the April 22 show was already sold out but a few tickets remained for the second San Francisco show, that Live Nation said it added due to popular demand. If you can't get tickets, or simply can't wait for O'Brien to come to town, you can learn all how he "half asses" the prepartion for the tour on his recently created Twitter account.